One of the things which we have discovered about poster collectors is that often – not always, but often – they develop an affection for a particular kind of poster, or a specific period, or an artist. Then, whenever they travel or go around and about, they look out for posters which fall within the category of things that appeal … and when they find it, BAM, it goes into the collection. We have a few collectors who – when they have had to move for reasons of work (or love) – have left us their posters to sell. One such collection – featured here – is from a nice man who now lives in Abu Dhabi, and who couldn’t take his treasured posters from the first and second World War(s) with him. This poster for the French government is famous not only because the artist who created it – Abel Faivre – was well known, but also because the rallying cry “ON Les Aura” (We will get them, we will beat them), was also well known. 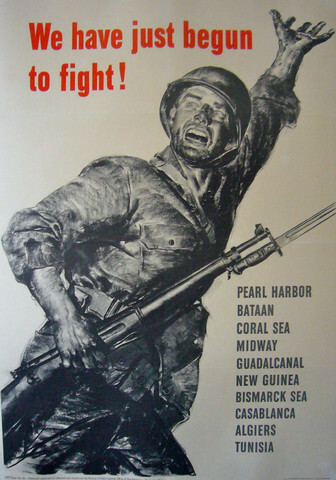 What is less well known is that during the Second World War, roughly 30 years after this iconic poster was produced, it was copied, by the American government, for its own purposes. The gesture is the same, the message is the same, only the face and place are different. Striking. Appealing to national pride, jinogistic ideals and a sense of duty – recruiting posters like this one for the Irish Canadian Rangers – were plastered on any and every available surface during wartime. It was a simpler time, when young men fought to register and fought with honor. To those men, we dedicate this entry. Previous Lights, Camera, Action…& Posters!